Right next to Coles Park is a portal that will take you back in time. BENGALURU: Right next to Coles Park is a portal that will take you back in time. Established in 1888, Wesley English Church is still standing tall, strong and proud. This year, the church completes 130 years; the premises don’t look the same as the day it was launched but each new addition (and deletion) has a story to tell. According to Meera Iyer from INTACH, the church’s architecture is similar to neo-gothic times. The presence of multiple arches is enough to testify the fact. “What stood out to me was the shape of the church. Most church halls are shaped distinctly in a cross. But Wesley Church is one of the few that started out being just rectangular. Eventually, small rooms were added and the church is now ‘t’ shaped,” adds Iyer. Another characteristic that is unique to this church is the roof. “Rarely do we see churches with a gable roof,” says Iyer. A gable roof consists of two roof sections, sloping in opposite directions, forming an open triangle of sorts. The foundation stone for the church was laid down on July 31, 1888. It was a bright and sunny Tuesday, almost like the church was meant to be a ray of sunshine in the times to come. “The Sunday and Monday before and the Wednesday after this day were wet rainy days. But Tuesday was a rather pleasant day,” says Hemalatha John, a retired English professor and senior member of the church. The total expenditure in building the church was estimated to be Rs 18,000, of which, Rs 14,633 was raised by the church. “Since this was one of the highest points in Bengaluru, initially, the church was named St John Hill Church. There is another church close by that goes by the name of St John’s Church. In order to avoid confusion, the name of this church was then changed to Wesley English Church in 1953,” explains Reverend DGS Rodricks, presbyter-in-charge. The first sermon at the church was conducted in the Easter of 1889, by Reverend J Hudson and the offerings amounted to Rs 310, a large sum for the times. In 1900, the church’s congregation consisted of 100 people, mainly pensioners. “Today, we have about 270 families in the congregation,” says Bindu Paul, secretary of the church. One of the milestone moments for the church was the revival of the Wesley Guild in 1908. The guild first came into existence around 1898, but due to reasons unknown, was shut down some time later. “The primary aim was to motivate youngsters to take part in various church activities. So, the guild was revived in a huge way in 1908,” John says. Besides being important to the congregation, the Wesley Guild also serves as a glimpse into the workings and impact the church had. According to John, the membership for the guild rose from 30 to 130 members, in a span of three months. Different branches of the guild looked into different activities. She elaborates: “The Sunshine League visited the sick in hospitals. The Dorcas Work Class reached out to the poor and the underprivileged.” During this time, the church also had in its possession a rich library of 1,200 books and tennis courts in the premises. For years, the guild flourished and involved the old and young alike in its activities. One of the fondest memories for the church was the guild’s anniversary celebration on July 16, 1937. A notebook that comprised the minutes of the various guild meetings came to serve as a time-machine and helped piece together a picture of the celebration that took place. “The expenses for the guild anniversary were recorded in the notebook, along with the items the menu consisted of: Plum cake, walnut cake, orange cake, coconut sweet meat, eight dozen puff, etc,” says John. The total expenses came up to Rs 28 and eight annas. From 1945 to 1949, however, many changes took place. There was a decline in the people attending the Wesley guild meetings. “We can’t pin point an exact reason for this but it was a difficult time. We had the World War and then the Indian freedom struggle. So the guild activities were slowly reducing,” explains John. The tennis courts were disbanded in 1945 and the library’s books were also donated. Eventually, the guild’s last meeting, its 41st one, was in 1950. On July 31, 1988, the church completed 100 years and the celebratory programmes, which included a service and lunch, went on for two days. It was also decided that the church would raise funds for two dear causes. “We wanted to raise a corpus fund for scholarships. The idea was to sponsor one non-Christian student. We also managed to raise funds for the renovation of Wesley Home (a home for senior women, started in the year 1889), which was completed in 2003,” says John. The window just above the church door has a special story behind it.The window was originally made of green and gold glass and underwent renovation in the year 1911. The window was then dubbed ‘Children’s Window’, since the expenses for the renovation were borne by the offerings the children of the Sunday school made. Today, a multi-coloured stain glass window, with the image of Jesus Christ, adorns the wall above the main door. From 2008 to 2013, the church underwent many renovations. This was done under the pastorship of Florence Deenadayalan, who pastor Rodricks describes as a “dynamic pastor”. The entire church was replastered and the altar was rebuilt too. “Earlier, the wall behind the altar was lilac-coloured with a simple brown cross,” recalls Paul. Today, there is a wooden panel with one big cross on it. The stained glass windows above the wooden paneling reflects the sun’s rays in mesmerising multi-coloured shades. “The flooring too was raised to a higher level so everyone could view the altar easily,” adds Paul. It’s interesting to note that the organ present in the church today is the third organ owned. The first was bought in 1916, at the cost of `960, an amount that was raised entirely by the church. The bell tower next to the church came to be so on June 30, 2013. “This was donated to the church by a family. 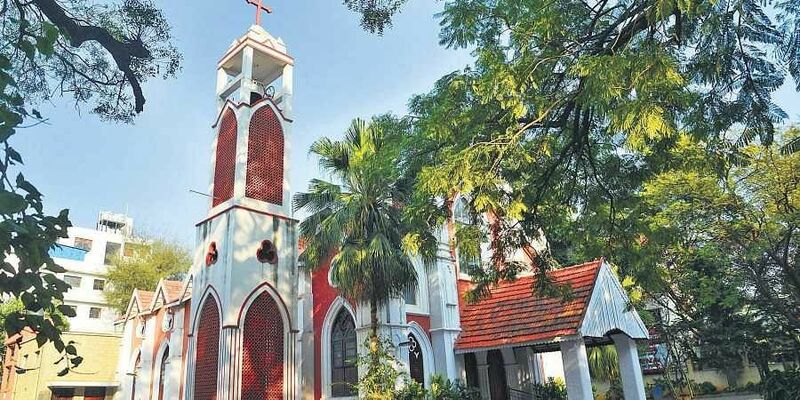 Some men from the congregation accompanied the family members to Kerala to check the bell,” says John.This was the latest addition to the church and one thing rung clear: In 130 years, the church made a mark on the lives of many, and will only continue to do so.